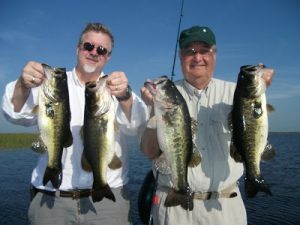 I fished with Doug Williams and his friend Weaver Hickerson from N.C. today, once again we caught some very nice bass. The bass are moving a lot, but they are biting when you find them. Okeechobee Bass Fishing Guides work hard to stay on the fish to keep our clients lines tight throughout the day.